The fall night sky of 2014 holds many attractive star targets for amateur astronomers, even observers in space. 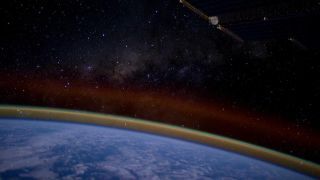 NASA astronaut Reid Wiseman captured this amazing photo of the Milky Way and its stars as seen from the International Space Station on Sept. 14. Autumn is under way in the Northern Hemisphere, and if you are an avid sky gazer you just might have noticed signs of the season's change. Many of the striking star groups and our beautiful Milky Way galaxy, which made for great stargazing on balmy summer evenings, are still visible in the western sky. But the appearance now of the brilliant star Capella ascending above the northeast horizon in the evening hours is a promise of the chillier nights to come. And indeed, in just another few weeks the constellation Orion and his neighbors will be dominating the evening skies, reminding us of the approaching winter season. During the mid and late-evening hours, the stars of the autumn season cover much of the eastern and southern parts of the night sky. In fact, this whole area has been called the "Celestial Sea," because many of the constellations have an association with water. For example, looking toward the south-southeast is one member of this watery fraternity; the only one whose name is attached to a popular song: "Aquarius." And yet how many who have heard the song know what the constellation Aquarius really is. This zodiacal star pattern traditionally represents a man holding a water jar (marked by an inverted Y-shaped group of four stars), which is spilling a vaguely marked stream of water southward into the mouth of another constellation: Piscis Austrinus, the Southern Fish. Across southern Canada, the northern United States and much of Europe, the stars that make up Piscis Austrinus usually cannot be seen. Although above the horizon, they are too low to penetrate the horizon haze. At more southerly latitudes these stars are much higher up in the sky, though still quite dim. The main star in Piscis Austrinus is all the more conspicuous: silvery-white Fomalhaut, ranked 18th brightest star in the sky and the only first-magnitude star in the whole collection of watery constellations. Indeed, Fomalhaut is the only true first magnitude star of autumn. Fomalhaut, somewhat isolated, lies in an empty region of the autumn skies, and is sometimes referred to as "The Solitary One." It can be identified by extending a line along the western (right) side of the Great Square of Pegasus about three times its own length. It is often described in various observing books as "reddish," though it is probable that the effects of our atmosphere are responsible for this impression, as this star is always seen at a low altitude for northern observers. Fomalhaut is Arabic for "mouth of the fish." It lies at a distance of 25 light-years, a star approximately twice the diameter of the sun and 19 times more luminous. If you look at Fomalhaut tonight, you're looking at light that left that star in 1989. "The loneliness of this star, added to the somber signs of approaching autumn and sometimes gives one a touch of melancholy. In November and December, when the winter stillness has fallen upon us, a glance toward the southwest will discover Fomalhaut, still placid and alone." And echoing what Ms. Martin wrote, I can only add that this is the time of the year when the days get shorter and the faces get longer. Editor's note: If you capture an amazing image of the autumn night sky and would like to share it for a possible photo story or gallery, send images and comments in to: spacephotos@space.com.